Is it possible for me to access security cameras remotely via the teleporter with AT&T HomeBase (ZTE Z700A). With this setup I do not get a Public facing IP from AT&T and am forced to deal with Carrier Grade NAT. I'm testing this right now unsuccessfully. Attached is my error log file if anybody can review. @matt-buffington Ill download the file and take a look to see what I can find. Just to clarify, you can access your cameras internally. Is your AmpliFi router in bridge mode? I want to assume so because most AT&T devices don't allow bridge mode. Yes I can access internally. I don't think the thoughts along the lines of "most AT&T" routers apply here b.c i'm using the cellular based AT&T Homebase - not their UVERSE, so I don't get a public facing IP. I attached an image showing there error I get when trying from the teleporter side. 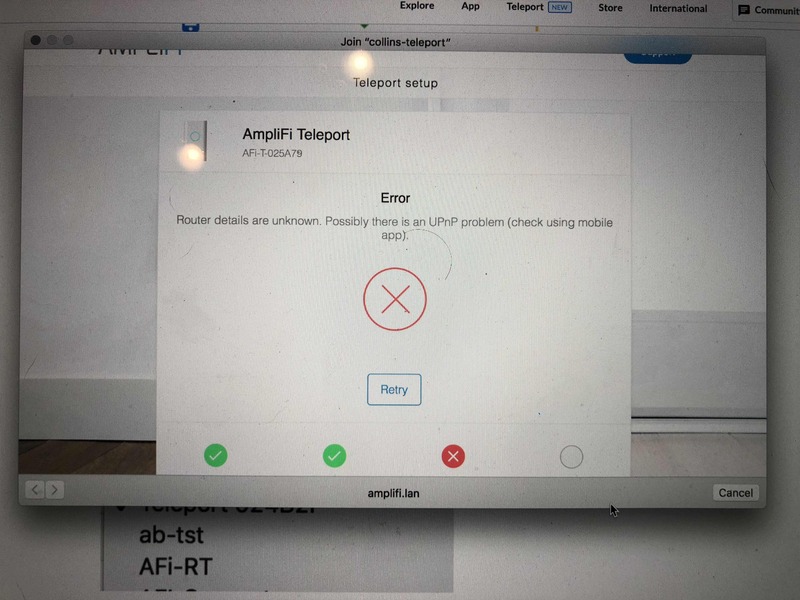 Also when trying from the Amplifi side of conneciton i get a upnp error 522. Why is the support so lacking on this product compared to the Unifi series? Since nobody appears at the ready with an answer I'm going to assume this device won't work in my situation and return it.